Brian Hammell is helping organize a Sept. 9 kickoff event for a proposed Arts District in the heart of the Blackwood section of Gloucester Township, NJ. He grew up and lives nearby and is a Ph.d student at Rutgers-Camden. To Rutgers-Camden graduate student Brian Hammell, Blackwood is much more than some textbook example of a South Jersey hamlet eclipsed by suburban sprawl. Hammell, 33, grew up nearby and moved to this venerable section of Gloucester Township — Blackwood was once a thriving railroad village with its own movie theater — in 2009. So last year, when he was looking for a project to fulfill a course required to earn his Ph.D. in public affairs, devising a strategy to help make Blackwood an arts district struck him as a good idea. "I like helping to make the community better," said Hammell, a master sergeant in the New Jersey Air National Guard who lives with his wife, Candace, and their two young daughters. Although he has completed the course, Hammell also is pitching in at the first Gloucester Township Food and Craft Beer Festival, set for Sunday in Blackwood. The event will help introduce the Arts District proposal to the public. "Brian came along at the perfect time," said Joseph Angeloni, president of the Gloucester Township Economic Development Corp., an independent community development organization Hammell has since joined. "We need to promote Blackwood, and bring people in. There are things happening there and we need to push it along," Mayor David Mayer said. "We're very fortunate to have Brian and his talents." As part of his Blackwood project, Hammell — who recently began working for Triad Associates, a community development firm in Vineland — collected data and did fieldwork, such as observing pedestrian and vehicular traffic. The opening of the Gloucester Premium Outlets, just south of the center of Blackwood, has made the pike busier, but the sidewalks remain almost empty. Last December, Hammell presented the corporation with a plan to encourage arts-related businesses such as galleries, artist supply stores, and coffee shops to locate in Blackwood. The township already has made streetscape improvements and offers tax abatements on improvements made to commercial properties. But a number of vacant, underutilized, or poorly maintained storefronts and buildings along the pike give downtown Blackwood a rather forlorn atmosphere. "I'd love to see a craft brewery in here," Hammell said, stopping in front of a landmark, long-empty bank building at the busy intersection of Church Street and the pike. "There's so much potential … here. There are plenty of opportunities for people to come in and open businesses." 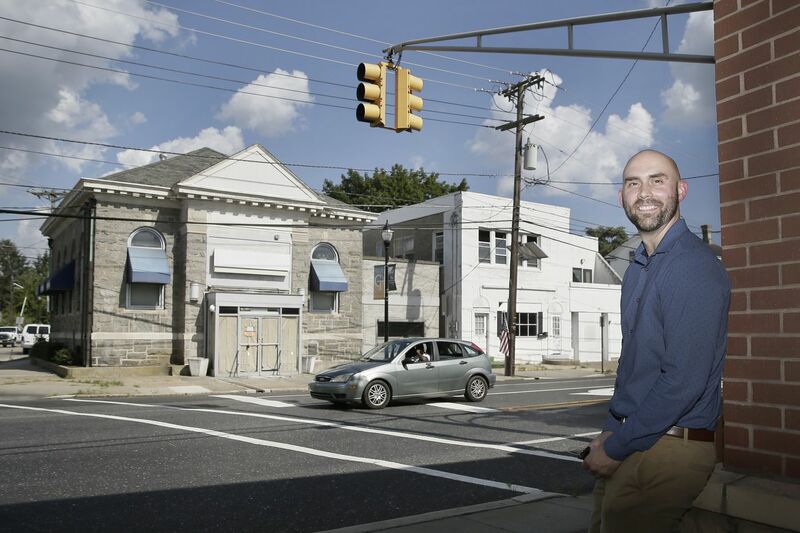 For Brian Hammell, a Ph.D. student at Rutgers-Camden, devising a plan to help promote an Arts District in Blackwoodwas not simply an academic exercise. He lives in Blackwood with his wife and their two daughters. I like Hammell's enthusiasm. But I'm skeptical whether a quintessential Camden County suburb like Gloucester Township can or will support a traditional town center. It's one thing for older, urbanized 'burbs like Collingswood or Pitman to reenergize formerly faded downtown areas as artsy, food-centric commercial hubs. But postwar suburbs have far different challenges: Cherry Hill, which has never had a downtown, seems to have given up on creating a walkable, bicycle-friendly town center at the former Garden State Park. But Gloucester Township is not Cherry Hill, and Blackwood, where remnants of a once-vital downtown endure, is not a former racetrack. Blackwood is listed on the national register of historic places and already is home to a busy branch of the Camden County Library system, a handful of thriving businesses, and the homegrown Mainstage Center for the Arts. “About 1,500 people a year, mostly kids, participate in our programs, taking classes, performing in show choirs and shows,” Ed Fiscella, who founded Mainstage 30 years ago, told me. Fiscella welcomes the Arts District concept and said his audiences likely would patronize coffee shops, restaurants, or other businesses. The presence of additional arts organizations — Mayer said a small performance space called a “blackbox theater” may be part of renovations to the library — also would be welcome, he said.